Buying a mattress is one of the biggest purchases you’ll ever for your home. Get the right one and you’ll enjoy blissful, uninterrupted sleep every night ,and wake up every morning feeling fresh as a daisy. Choose poorly, and you could be tossing and turning when you’re supposed to be resting, and crawling out of bed feeling like you’ve barely slept at all. We know that everybody’s different, and that what you need and want in a mattress varies from person to person. We’ve put together this buying guide to make sure that you have the tools, information, and power you need to make an informed and well-researched decision when shopping for and buying a new mattress, so that you can understand the pros, cons, and subtle differences between the different mattress types available, and make up your own mind about what’s right for you. Seeing as you’re consulting a mattress buying guide, the chances are that that you’re not sleeping well. Most traditional mattresses have a lifespan of around eight years. This isn’t set in stone – some mattresses can live long past this point, while others are past their prime after only a few years. There is no hard and fast rule on this. The main function. No, the only function of a mattress is to help you to get a good night’s sleep and to wake up feeling refreshed, happy, and ready to start the new day. Regardless of how old your mattress is, if you’re tossing and turning during the night, waking up feeling groggy, if you’re in pain through sleeping badly, or you’re unable to nod off to sleep again after waking up, you probably do need a new mattress. This seems like a simple question, but there are positives and negatives to each mattress size. Sure, a super king seems like the height of luxury and decadence, but if you can’t actually find your partner during the night because they’re all the way over on the other side of the bed, it probably isn’t the best idea. If you’re living alone and on a budget, a single mattress might seem the obvious choice, but will that size meet your needs for the next several years? If you’re six feet or over, things can start to feel a little cramped if your scalp is pressed against the headboard and your feet are poking out of the bottom. Do you share your bed or are you likely to be sharing your bed? Cuddling close is great, but everyone needs a little space. Younger kids love coming into mum and dad’s room in the morning to bounce on the bed and share a cuddle, while dogs and cats can be extremely difficult to dislodge from the comfiest place in the house. Can you accommodate a large mattress without sacrificing too much quality living space? Would you still be able to open your wardrobe doors with a super king sized mattress filling the room? A king sized mattress is the ideal option for most couples, offering plenty of sleeping space and room to stretch out without the danger of losing one another in the night, or dominating the entire room. However if you’re particularly large, or you have children or large animals sharing a bed with you, the super king offers an extra 12 inches width and may be more suitable for your needs. What mattress type should I buy? Back in your grandparents’ day, mattress choices were limited to whether you wanted it stuffed with straw, feathers, wool, or clunky iron springs. Thankfully, this is the 21st century and there are a vast range of materials available, designed specifically to make sure you get the best night’s sleep possible. Innerspring – The most common type of mattress – probably what you grew up sleeping on, and may even be sleeping on now. These mattresses have one or more layers of metal, generally steel, spring coils that provide the support. Number of coils, coil type, coil units, layers of coils, individually wrapped coils, and other attributes may vary. More coils generally means better support (since you have fewer individual pressure points). 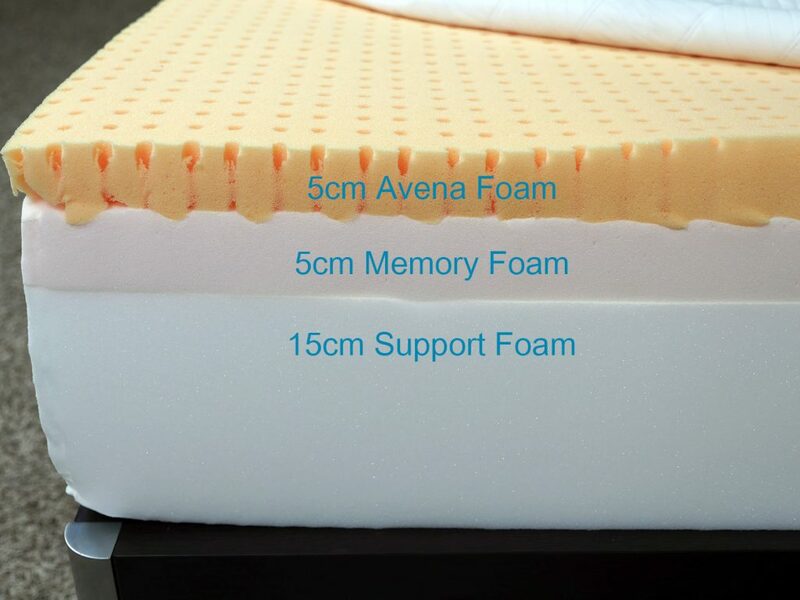 Latex Foam – As the name suggests, these mattresses are built exclusively with latex foam, and are best known for their comfort and cooling properties. 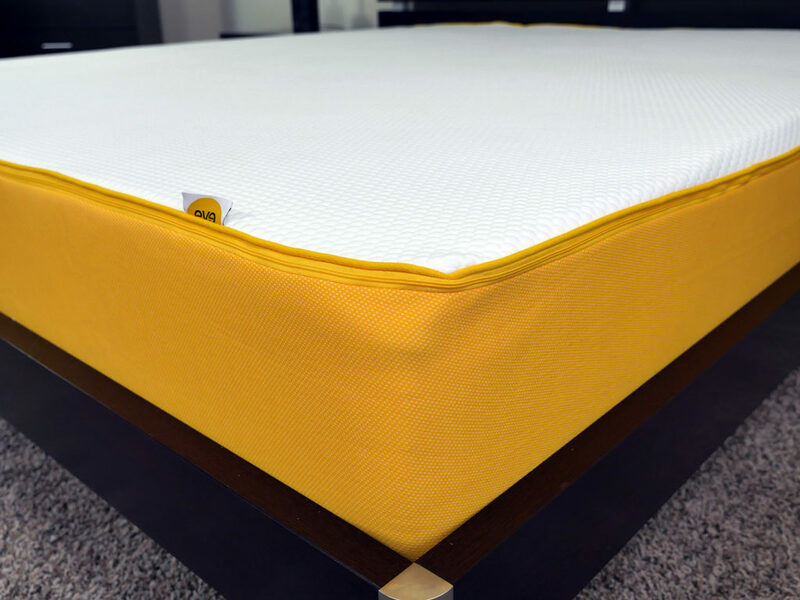 Most natural latex mattresses are hypo-allergenic, however, if you know you have a latex allergy, you should probably avoid this type. Memory Foam – These mattresses are made of memory foam only, and are known for their great support, pressure relief, and body contouring. Traditional memory foams can have a tendency to trap heat over the course of the night, perhaps leaving you a little too toasty. More advanced and modern memory foams are generally built with a larger cellular structure, which improves cooling. Gel – These mattresses include a layer of gel foam, and generally offers different comfort, feel, and cooling features. Pillow-top – Pillow-top mattresses fall into many categories, they may be innerspring, latex, memory, hybrid, or another entirely. The unique attribute is the layer of soft material sewn to the top of the cover or stuffed inside the cover, adding extra cushion and comfort. If you type this query into Google, the chances are that the top result will be a big name department store. But you don’t necessarily need to go with this – there are choices out there, and it’s probably not a good idea to limit yourself to one source of information or rush into what is one of the most important purchasing decisions you can make, there’s a whole world of choice out there. Obviously, if you’re looking for a specific type of mattress or a mattress at particular price point, that will change the locations that are available to you. Salesmen have one job, and that is to convince you to commit to making a purchase. Whether or not that purchase is the right one for you depends on the ethics of the individual salesman. Traditionally, these have been one of the few places you could purchase a new mattress. Both department stores and specialty mattress stores offer a very similar feel and similar price points. Online stores can be a great option as they generally have a broader selection and more competitive prices. In addition, what could be better better than shopping from the comfort of your home, without being harassed by a mattress salesmen? You won’t be able to lie on the mattress before purchasing, so look for one with a long in-home trial period if you do buy online. Many mattress companies are completely eliminating the middlemen by selling and shipping mattresses direct to the customer. In terms of price, there is simply no better way to go. You get a much higher quality product for a much lower sticker price than you’ll find anywhere else. Comfort – This is, above all, the most important factor, the mattress should be comfortable. 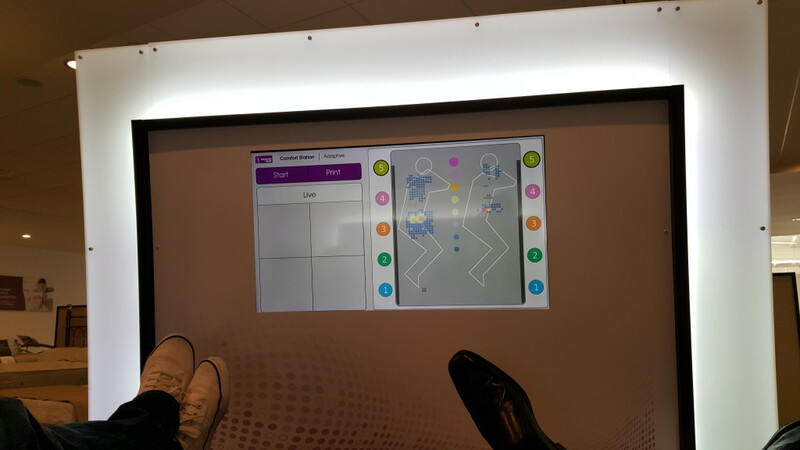 When you lie down, there shouldn’t be any pressure points on your body. Cooling and mattress breathability are also vital to the overall comfort of a mattress. Support – Support is all about keeping your spine in alignment. If the mattress doesn’t provide adequate support, you’ll likely wake up with pain. Motion Transfer – If you sleep with a partner, this is especially important. How much do you feel the other person when they are moving during the night? Does it wake you up? 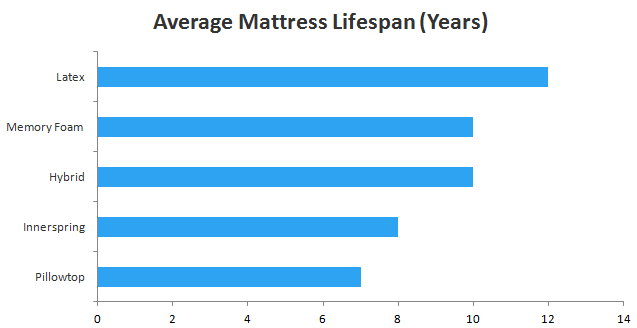 Durability – What is the typical lifespan of the mattress? Eight years is fairly typical for a mattress, so if it’s much lower than that, you may want to reconsider. A good warranty is helpful in this area. Edge Support – A mattress with strong edges is important for both sitting and lying near the edge. If the edge sinks dramatically or collapses entirely it can effectively roll you off the bed when you’re getting up or even sleeping during the night. What mattress is best for back, stomach, and side sleepers? Everyone sleeps differently, and what position you adopt while slumbering will have a huge impact on how comfortable various types of mattress will be for you. Not every mattress is suitable for everyone. Stomach Sleeper – Sleeping on your stomach, tends to put the back and spine under stress, and can lead to backache and discomfort. Generally stomach sleepers prefer mattresses in the neutral to slightly firmer range. By using a slightly firmer mattress you get better support to help keep your spine in alignment. Side Sleeper – If, like me, you prefer to rest on your side, you probably also prefer a softer mattress. The human body when it’s on its side isn’t a straight line. You need the mattress to contour to the curves of your side, and too rigid a mattress will put pressure on the weight bearing portions of your body. Foam mattresses are a great choice here, as they provide superior body contouring. Back Sleeper – Typically a mattress in the neutral or slightly firm range is best for back sleepers. The most important factor is providing support for your lower back. A mattress with no give will put stress on your back, but one that is overly soft will not provide enough support, creating pain in the lower back. How much should I pay for a mattress? This is the big question, and the old adage, ‘You get what you pay for’ does not necessarily hold true here. There are so many factors involved in the manufacture, storage and distribution of mattresses – not to mention profits for the stores and companies behind them that prices can vary wildly. Higher price does not necessarily equal a higher quality of mattress. Decent foam mattresses cost at least £200-£250 to manufacture, so realistically, if you’re buying below that price point, you risk getting a lower quality product. Cheap mattresses – They are cheap for a reason. If they cost less than the minimum manufacturing cost for a good quality mattress, it’s likely that they are made using inferior materials or slipshod production techniques. It’s unlikely that they’ll stand the test of time or be particularly comfortable. Cheap foam mattresses – There was a time when every household would own a cheap foam mattress for use as a guest bed or as part of a fold out futon. They’re cheap, they’re handy, but they are also lower quality, more toxic, have higher levels of off-gassing, and are generally less durable. Fantastic if you have unexpected visitors, but don’t plan on sleeping on one for an extended period. Bed superstores – They’re great if you want to get a feel for a physical product or maybe spend an afternoon trying out the different products on offer, but as we said earlier, these places are teeming with pushy salesmen, and they are expensive thanks to the overheads of having an actual physical building and employing those pushy salesmen. Regardless of whether you think you’ve found a bargain, the chances are that you’ll be able to find an equivalent mattress online for less than half the price. Buying Online – Buying direct from mattress companies is, in my opinion, the best and cheapest option. With no middlemen and lower overheads, the costs to you is lower, and the quality of the mattresses is usually higher. Because you can’t actually try these mattresses out in store, most direct mattress companies offer an extended trial period, during which you can send the mattress back if you don’t like it. Most quality online mattresses cost between £350 – £1,000. It’s difficult enough as is making sure the mattress you like in the store is the one you still like when you get home. If you do have an opportunity to lie down on the mattress before you purchase, always make sure to give at least 10 minutes . This gives your body chance to get used to the feel, your muscles a chance to relax, you’ll have a much better idea of how you’ll like the mattress during a full night’s sleep. Do I need a Divan? To be honest here, most bed frames in the UK haven’t used traditional divan design for a long time. Sure, everyone had one in the 1980s and 1990s, but most bed frames you’ll find today are simply frames with wooden slats. FAQS: Do you need a Divan? 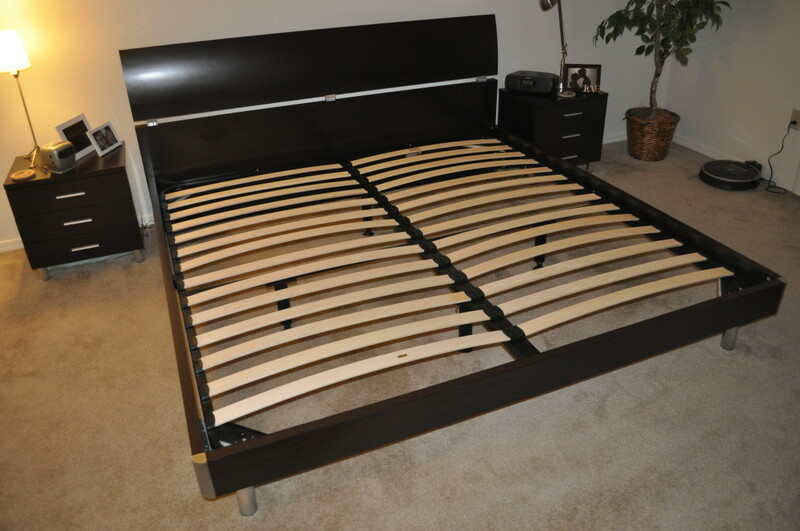 Divans provide support, allow the mattress to breath, and raise the height of the bed itself. Many mattress warranties require the mattress be supported. If you do decide to ditch the divan, make sure to check your warranty to understand what steps you do need to take to maintain it. What about mattress trial periods? Most mattress companies offer some kind of a trial period. However, be sure that terms of that trial period are crystal clear before purchasing. Some companies offer a ‘comfort guarantee’ or similar wording, which may allow you to return the mattress, but not at the full price you paid for it, or may stipulate that you can exchange it for another mattress from the same place – essentially a store credit note. In addition, there may be re-stocking fees, return fees, shipping fees, among others. Be wary of these guarantees and always ensure you know exactly what the terms are for returns and refunds. Many companies that ship mattresses direct from the factory have much more friendly returns policies, with in-home trial periods ranging from 75-120 days. The return process for these types of mattresses is generally quite straightforward. Below are examples of the trial periods you’ll find for many factory direct mattresses. Warranties vary in both length and terms. Just as with the trial period, always ensure that you know the exact terms of the warranty, specifically what constituents a defect that would allow you to get a new mattress. Most warranties are in the 10 year range, with some companies offering warranties in the 15-25 range. Below are a few examples of warranty periods of various mattresses. The above warranties may not reflect all models or units of that mattress brand (use as an estimated guideline only). Always check your warranty documents. Various models, years, stores, and other factors will determine the exact specifications of your mattress warranty. Feel and Comfort – When looking at any mattress, look at the support, comfort, and edge sinkage. When lying down, do you feel like your entire body is supported? Is the mattress creating pressure points? Does the edge sink dramatically when lying or sitting on it? Trial Period & Warranty – I can’t stress this enough! Confirm the trial period and warranty details, and if possible, get it in writing! Make sure you know the exact terms for return and refunds, and also double check on what counts as a defect for your warranty. Do you get a new mattress? or just a percentage of the money back? Test & Negotiate – Test mattresses at several stores to compare prices and different mattress types. If you are shopping in a brick-and-mortar store, you can use the prices at nearby stores to negotiate with. Many stores will price match competitors, although this is less likely with chain department stores. So make sure you get several price comparisons. And always make sure to comparison shop prices online.